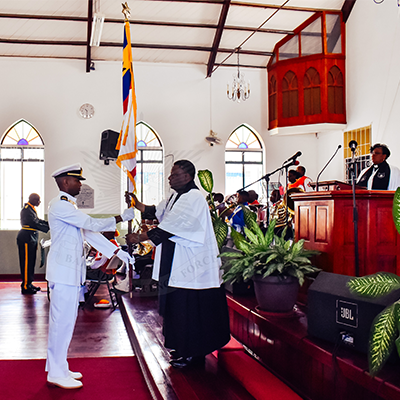 The Barbados Coast Guard (BCG) celebrated the 11th Anniversary of the commissioning of the HMBS PELICAN with a parade and church service at the White Park Wesleyan Holiness Church on Sunday 9 September 2018. The Chief of Staff, Colonel Glyne Grannum was the principal guest and was afforded a salute at the post-service March Past. Commanding Officer (Ag) BCG, Lieutenant Commander Derrick Brathwaite, during his address reminded those in attendance of the responsibilities of being the maritime unit of the Barbados Defence Force. The BCG’s responsibilities include the enforcement of provisions of every law relating to the regulation of any harbour or port of Barbados, quarantine, immigration, fisheries, territorial waters and economic zones, safety at sea, the detection and prevention of the contravention of laws relating to revenue and customs; the prevention or persons from boarding, holding or clinging on to any vessel without the permission of the master of the vessel, and, if necessary, the removal of any such person from the vessel. For the purposes of carrying out their duties, the members of the BCG have the same powers, authorities and privileges as are conferred by law on members of the Police Force. In her sermon, Reverend Esther Willoughby encouraged BCG, the wider BDF and the congregation to put God first in everything, including in the at times dangerous work on the seas. She also reminded the congregation of the BDF’s core values of integrity, loyalty, selfless service, commitment to duty, disciple, respect and courage, drawing reference to their biblical underpinnings.